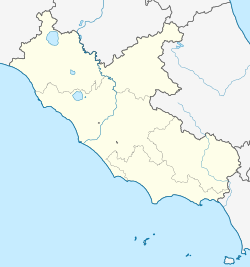 Vitorchiano is a comune (municipality) in the Province of Viterbo in the Italian region Latium, located about 70 kilometres (43 mi) northwest of Rome and about 7 kilometres (4 mi) northeast of Viterbo. As of 31 December 2004, it had a population of 3,690 and an area of 29.8 square kilometres (11.5 sq mi). Vitorchiano borders the following municipalities: Bomarzo, Soriano nel Cimino, Viterbo. ^ Tourism information from Comune of Vitorchiano. This page was last edited on 18 December 2018, at 21:34 (UTC).